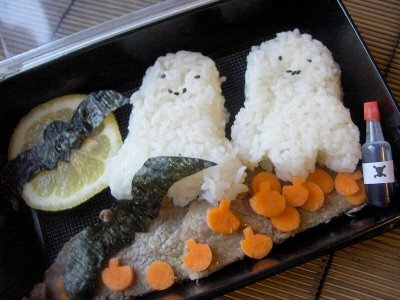 If you have ever played with your food as a child, bento box making might be the hobby (and lunch choice) for you. 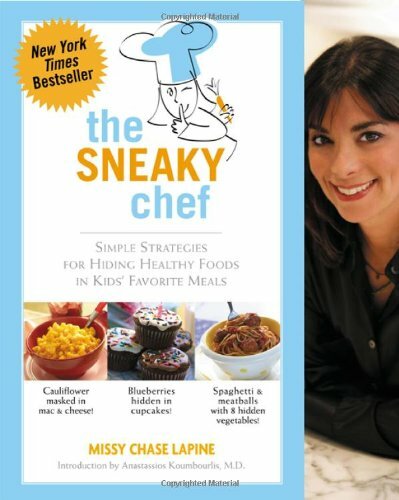 Should You Sneak In Your Veggies? Aside from being deceptive and breeding distrust, she asks a more important question? In the end, I suppose one has to ask an even more basic question: Do vegetables treated as prescribed and in the amounts indicated by Seinfeld-the-Deceptive and Lapine-the-Sneak really add enough nutrients to a child’s diet to make the plotting and pureeing worthwhile? How valuable can one half-cup of spinach puree and one half-cup of carrot puree be when they are first cooked, then are again subjected to the heat of baking, finally to be divided among 12 brownies? And can there be any meaningful nutrition from a quarter-cup each of carrot and sweet potato puree divided amongst 10 portions of soup? The way I look at it, what if you ALWAYS put pureed carrots into macaroni and cheese? You tell the children about it and they watch you make the recipe that way. Would it make your mac and cheese a little healthier? Yeah, a little… Would it be deceptive? Not if you’re up front about it. All kids go through phases where they just won’t eat certain foods. I’ve heard that it’s because their taste buds are more sensitive to the bitterness that accompanies many vegetables. Masking that flavor is one option to get them to eat their vegetables, but more importantly, providing a good example is FAR more powerful. If YOU eat your vegetables, you do more than all the blenders in the world could accomplish. These shoes would be perfect for running outside at night. There’s no way you would be the invisible pedestrian with these shoes. They are sold as fashion shoes to wear at raves and are currently out of stock, unfortunately. The shoes are “powered” by glow sticks. You open the channel at the back of the shoe, insert the glow stick (after activating it) and close it back up. Glow sticks are easy to buy in bulk and you only need to “turn your shoes on” when you are running at night. Brilliant! When will the running shoe companies realize that THIS is the number one safety feature we need when running outside? Reflective surfaces are nice, but glowing on our own gives the drivers MUCH more time to notice us. I usually don’t talk about treadmill recalls, but the Cybex treadmills have been recalled TWICE now. 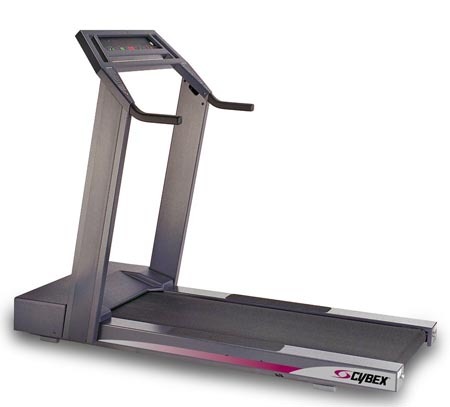 This recall involves the treadmills “Cybex 400T,” “Cybex 410T,” “Trotter 510,” “Trotter 525”, “Trotter 535”, and “CXT+” that were recalled (link) on October 8, 2003 and later repaired. The treadmills are black with gray coloring, have rectangular uprights, and measure 69 inches long and 30 inches wide. The brands and models are written on the display panel. The â€œCXT+â€ model does not bear the brand Cybex or Trotter. There have been five fires associated with these treadmills, so get this problem fixed before your house goes up in smoke. Are you letting your fears about other people seeing you workout stop you from getting fit? Every time I’ve run for the last year has been with my iPod. Because the Nike+ records my runs, I WANT my iPod with me when I exercise. NekFIT is an iPod holder to use while you exercise. It can be used with all three styles of iPod Nanos and the shuffle. This looks pretty cool, but at 34 bucks, it’s a little pricey. I would be worried that it might fall off or get really sweaty on my neck. Cool thing is that it will work with the Nike+ without any problems. Have any of you tried this? It’s looks kind of cool. The truly embarrassing thing about posting the winners every week is my mileage. I was sick all last week and didn’t even walk around the block, so my numbers look horrible. Next week, I’ll do better! Let’s see how everyone else did! 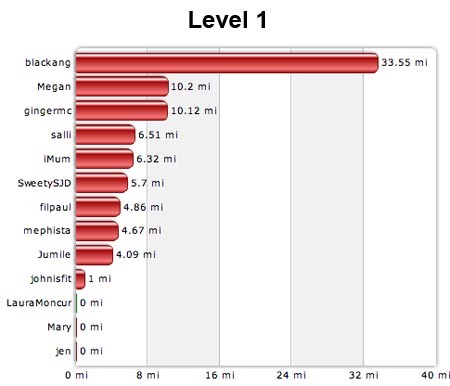 Megan barely beat gingermc this week on Level 1. Good show! Uncool, blackang! 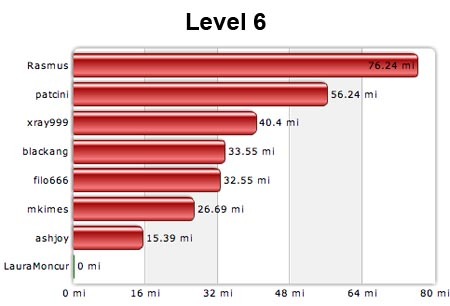 Choose the correct level for your mileage. It was a close race, but Ivano_M beat out manical on the Level 2 Challenge. blackang, go to Level 4 where you belong. Bad form, timmz and SEEN. Join the appropriate level for your mileage. 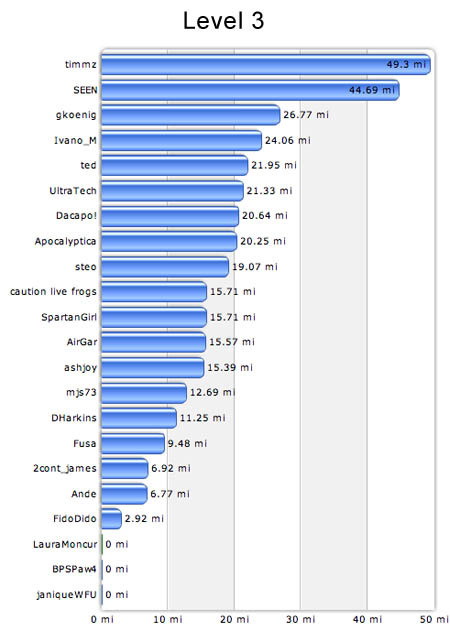 The true winner of the Level 3 Challenge is gkoenig! timmz was disqualified because he joined a level way below his ability. 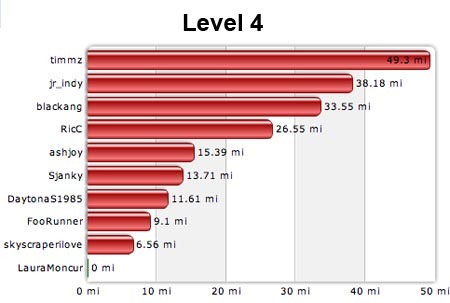 The REAL winner of the Level 4 Challenge is jr_indy. Keep it up! For the third week in a row, Ashjoy has taken Level 5! Rasmus‘ mileage is back up to its huge numbers. Good job! 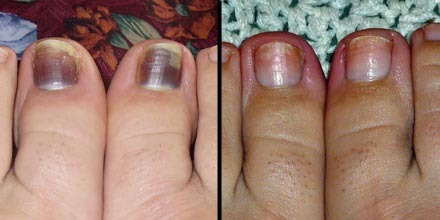 I can tell you the exact day I got black toenail. It was December 20th, 2006. Even though my nails are still a little damaged from that day, I can tell you that they are finally healed. Yes, it took TEN months for my nails to grow back. I spent all summer with ugly feet because I didn’t SLOWLY increase my mileage. 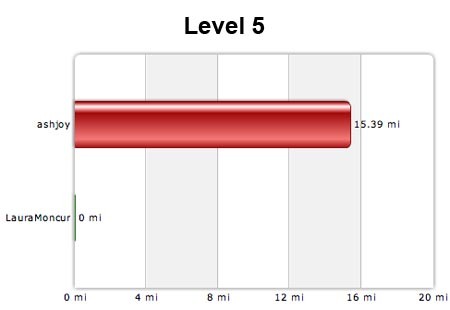 I went from doing one or two miles a day up to doing five and ten miles a day. I figured that since my muscles could handle it, there was no problem, right? Wrong. The weakest link was my toenails and I paid for it for ten months. Fortunately, it didn’t hurt more than a few weeks of that time and when they grew back, they look just like they did before. Don’t be stupid like me. Take care of yourself. Slowly increase your mileage to protect your muscles, your joints AND your toenails. I’m just so glad to have my normal feet back! I feel like celebrating! 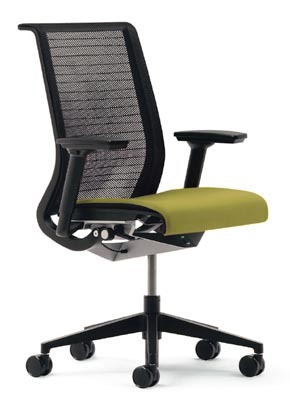 Steelcase is an up-scale furniture design company that has taken the treadputer to heart. I can find NOTHING about the Walkstation on Steelcase’s website. They are best known for the Think Chair, which is “the simplest, most streamlined embodiment of our deep understanding of people who sit, and how they sit throughout the day.” If they profess to know people who sit so much, I wonder if they know anything about people who walk and run all day. 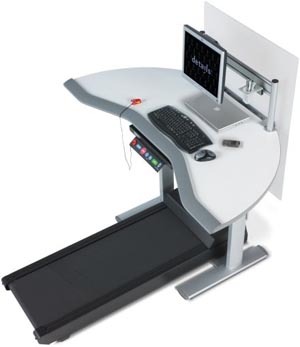 It looks like the Walkstation is merely an elevated work table over a sub-grade treadmill. You probably would do better to go to Home Depot, get the supplies and build one yourself. You get to choose your treadmill that way. Rumor has it that a Walkstation is going to cost $6500. Do you think it’s worth that to have a computer at your treadmill? I while back, I logged on to Fitness Journal to see what it was like. It looked like a pretty good way to track my exercise and food. I was just playing around with it to see if I LOVED it enough to do a review of it. I didn’t, but it looked good enough that I didn’t HATE it and think I should warn people about it. Here is my challenge to you: I’d like to give you FREE access to your fitness journal between now and the end of the year, and invite you to try a REVERSE New Year’s resolution. Instead of making a resolution to get fit ON the first of the year, make a resolution to get fit BY the first of the year. Imagine how great it will feel to get to January 1st and ALREADY be healthy and fit! While I’m not going to take them up on using Fitness Journal, I’m going to take them up on the Reverse New Year’s Resolution challenge. To get healthier by January first is the BEST time to make that resolution because the holidays are the most food-laden time of the year. Join me and get healthier by January first. What would you like to achieve by then?